Last month the global chemicals giant Syngenta applied to the UK government for an “emergency exemption” from a temporary EU ban on the use of pesticides containing neonicotinoids. Thanks in no small part to the activities of environmental protesters and the campaigning organisation 38 Degrees, who delivered a petition of 200,000 signatures to Downing Street, Syngenta eventually decided to withdraw its request just before the cabinet was due to discuss it. That Syngenta had the temerity to make the application in the first place shows how far they are prepared to push the pursuit of profit over the interests of the environment. Neonicotinoids have been identified by a long string of scientific studies as being a very likely contributor to the worrying decline in bee numbers of the last decade or so. Bees have been on this planet for approximately 40 million years and, until very recently they have thrived, along with the many plants that they pollinate. But now they are in serious trouble, mostly as a direct result of post second world war intensive farming practices, in particular the widespread use of monoculture and the associated dependence on pesticides. In recent years here in the UK we have lost three species of native bumblebee, and six more are officially designated as endangered. A similar picture of bee species loss is emerging across the rest of Europe and North America. For a glimpse into how a world without the bee might look, take a look at these extraordinary photographs of human pollinators in the apple and pear orchards of Sichuan, south west China. There, excessive pesticide use in the 1980s and 1990s completely wiped out the local bee population. Without bees and other pollinators we would lose three quarters of the fruit and vegetables upon which we currently rely, and there are simply not enough humans in the world to pollinate our crops by hand, even if every single one of us spent every single minute of our lives doing so. Before World War Two, organic farming was the norm. Our crops had been grown for millennia without chemical intervention, and pests were kept under control by simple but sound techniques such as crop rotation, companion planting and biological pest control. By contrast, intensive farming actually encourages pest build up by concentrating single crops in large areas. To safeguard our own long-term future on this precious planet we have to nurture our bees. Collectively and individually there are plenty of small steps we can take – for example disposing responsibly of any pesticides in our sheds or garages (and vowing never to use them again), planting bee-friendly flowers and, very simply, through the choices we make when we buy and grow our food. Organic is better for you, better for bees and better for the planet. This recipe is for a lovely, comforting dish using pak choi, which I grow organically each year on my allotment plot, the Circus Garden. Pak choi is ideally suited to the UK climate, although it does have a habit of bolting during periods of hot weather and/or drought, so needs careful watching and picking at the right time, which on my plot I sense is just about now. I’m also using organically-grown spring onions, chilli, garlic and Thai basil from my allotment in this dish. Those who consider tofu to be bland or boring should really give this recipe a try – I think it might just convert a few sceptics. When tofu is prepared and cooked properly it is anything but bland or boring. The key is to think of your block of tofu as a sponge, so remove as much moisture as possible from the tofu before you begin, to encourage it to soak up the beautiful flavours of the sauce. Coating it lightly in corn or rice flour and frying it in hot oil before adding to the other ingredients will help give the tofu a lighter, slightly chewier texture. 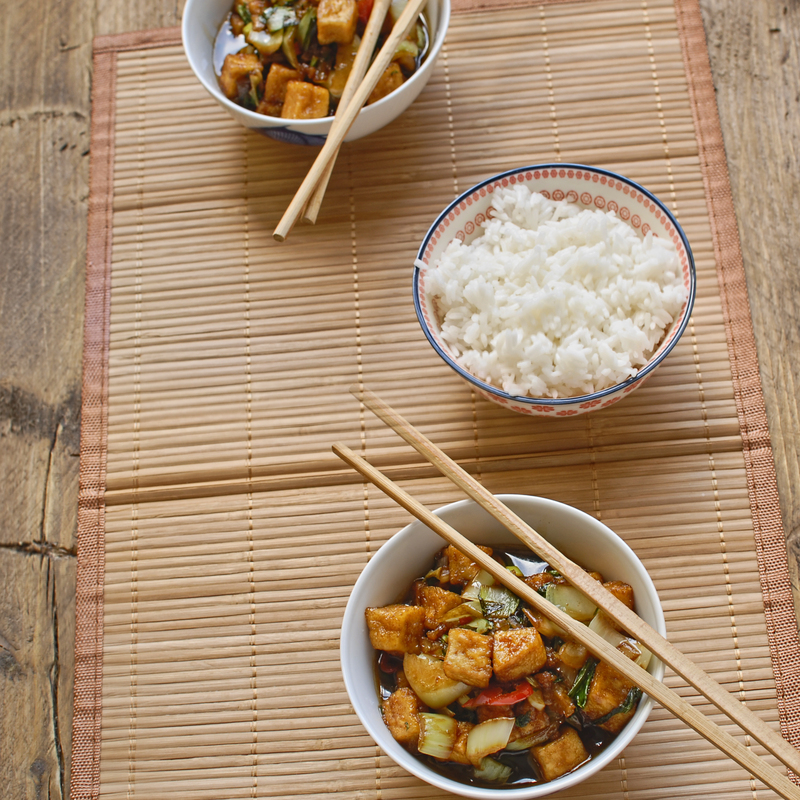 In this simple but wholesome vegan dish the Vietnamese-style sauce imbues the tofu, the pak choi and the other ingredients with a lovely, deep, slightly caramelised flavour. 1. First prepare the tofu by wrapping the block in a clean tea towel or several layers of kitchen paper and placing it between two flat chopping boards or baking trays. Put weights carefully on top and leave for at least thirty minutes. 2. In a small bowl mix together the soy sauce, sake, maple syrup and water. 2. Unwrap the block of tofu, wipe it dry and cut into 1-2 cm cubes. Roll the tofu cubes gently in the cornflour so that they are lightly coated. 3. Heat a wok over a high heat. As soon as it begins to smoke add the groundnut oil. After thirty seconds add the tofu (you will need to do this in a couple of batches to avoid crowding the wok which would lower the temperature too drastically). Cook, stirring from time to time, until the tofu has crisped up and browned slightly. Remove from the pan with a slotted spoon and drain on kitchen paper. Set to one side. 4. Keep the wok on the high heat, adding a little more oil if needed. Add the pak choi and the spring onions and cook, stirring, for 3 minutes. Next add the tofu, chilli, garlic and basil. Stir-fry for 30 seconds then finally add the soy sauce mixture. It should immediately bubble up. Stir the contents of the pan to ensure everything gets a really good coating of the sauce then remove from the heat and serve immediately, accompanied by jasmine rice. A lovely sounding recipe and thanks for the tips on drying the tofu and coating in cornflour. I’ve had mixed results with tofu in the past, so will try this method. Thanks Ann. I’ll be interested to know how you get on with this technique. Personally I could eat this dish every week and not get bored with it. Sorry to ask about brands but I was wondering what brand groundnut oil you would recommend? Most supermarkets stock groundnut oil, but for organic versions you will probably have to shop elsewhere. There is Bio Planete, which is expensive but very good, generally available from health food stores or direct from Suma wholefoods. Other good organic brands that are sometimes stocked by health food stores are Spectrum Naturals and Pearls of Samarkand. Anything with thai basil in gets my vote…yum! Your post reminded me of the furore in Ribeauville Alsace last year when French beekeepers discovered their bees were ignoring fields of flowers and pollinating the carelessly discarded sweet waste of an M and m factory some 200 miles away. This carelessness came to light when the regions bees began producing vibrant hued honey spanning the whole spectrum of the rainbow. Corporations need to act responsibly and respect our environment. By the way I love your tofu. That’s an astonishing story. Thanks for sharing it, and also for your comments on the recipe.